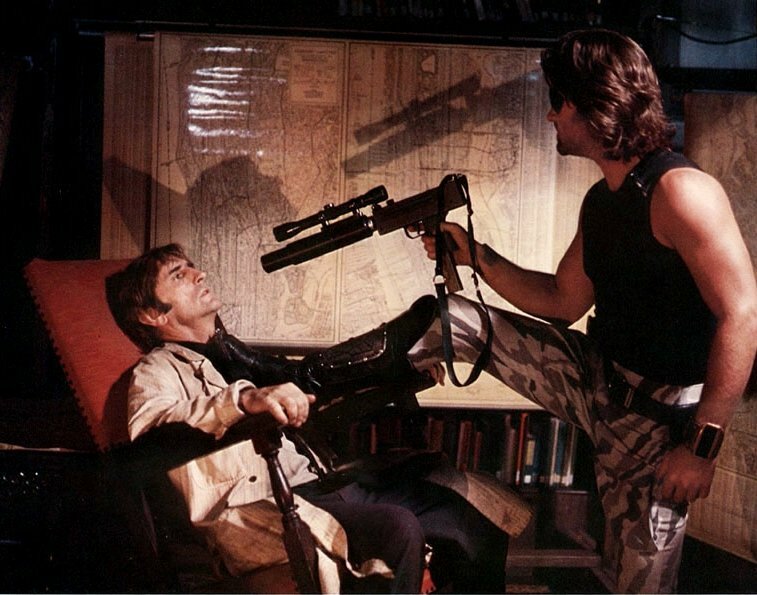 Here's the first of a bunch of stills from Escape from New York. Enjoy. "I hear you don't want any Christians in your car." Don't move...the fly landed on your nose. F--K you. I still say a scope that long on a gun that shoots pistol rounds is f--king stupid. "Call me Dexter Reilly again and see what happens." "Avenge me, boys! AVEEEENNNNNGE MEEEEEE! Oh wait, wrong movie." "I'm really not into guns ... but I do like your boots." "I'm sorry I said you looked gay. I meant to say you look really tough with those trousers, boots, sleveless shirt..."
"Yeah Snake, your gun barrel looks clean to me." "Well Brain, my little friend here and I say that feathered hair IS still in style."